On hot summer nights, the coastal strips of Lima, Peru are dotted with beach-loving partiers, soaking up the moonlight and twisting and shaking to the rhythm of deep techno beats echoing through the air. The plazas are filled with families out for a night stroll, historical monuments glow on the cityscape, and entertainers ring out in song and dance, bringing cheerful grins to amused onlookers. High up above, in the quiet stillness of the vast Andes Mountains, lies a tiny village tucked away in a remote corner of the rugged peaks. In San Pedro de Casta, a town of only a thousand people, families gather around their stoves to keep warm, resting on dirt floors as the evening fog rolls in. In the morning, these families will wake with the sun and set to work on the land. There are crops to be tended to, cows to be milked, water to be collected. And the children are needed for help. Thousands of years ago, San Pedro was a lush plateau with green landscapes sweeping over the mountainsides and bountiful water sources bubbling plentifully. Over the years, the climate changed and the water dried up. What’s left is a rugged, dry land, with no real water source except what melts off from the mountain peaks in the winter. While this water is better than none at all, it is limited, dirty, and unharnessed. Collecting the water each day proves to be a difficult and burdensome task for the villagers, and what is collected isn’t even clean. Without clean and sufficient water, the village suffers severely. Villagers struggle to grow crops in the arid climate, so what does grow is mostly used for sustenance rather than as a financial resource. Typhoid and waterborne illness are rampant among the villagers, and children are frequently infected with parasites and diseases. Lack of water also creates a cycle of malnutrition for the livestock and thus the villagers, leaving 80% of San Pedro’s children malnourished. Water is an essential human right. Every human being on earth deserves access to clean, safe water. And currently the water available to the villagers of San Pedro is neither clean nor safe. The quality of life in San Pedro would exponentially increase with proper access to this basic human need. A few years ago, Globe Aware volunteer, Beth Karbe, traveled with a few friends to help out in the village of San Pedro for a week-long volunteer vacation. During their time in the village, these women experienced firsthand the difficulties of life without abundant clean water and saw the effect it has on the people. Their time was rich, full of culture exchange and understanding, and even included the opportunity to join in on a special village ritual before departing. Beth would tell anyone who visits the village of San Pedro to beware: upon departure you will not be the same person as you were when you arrived. The joyful and determined spirit of the people of San Pedro will open your eyes to a type of people many humans will never meet. In fact, ask any Peruvian about the small, isolated village, and most will be unsure what you are referring to. But to those who have been and have seen the mystical wonders of this ancient mountain town, intrigue, delight, and joy light up their face when they think back on the experience it offered. For Beth Karbe, interaction with the San Pedro villagers left her wanting to do more to help. Teaching the village children, working on construction and improvement projects for facilities, and providing a heater for the local school were all great accomplishments the volunteers saw during their week-long trip, but Beth could not shake off the community’s need for water. She knew that since clean water was not available to the village, she was going to have to Bring it! Bring Water! became the name of the new project Beth initiated throughout the next year to help fundraise $22,000 for the village of San Pedro. This money would supply innovative, top of the line water filtration systems within homes and community facilities in the village. The resources were even able to extend beyond San Pedro and provide water filtration systems for numerous villages in Ghana as well. The donations have been made. The water filters are ready. The people of San Pedro are waiting. This June, Beth Karbe and a group of volunteers will be returning with Globe Aware to San Pedro once again, this time to bring clean, safe drinking water that will permanently improve the quality of life for these villagers. The great news? Many hands are needed and we are still looking for extra volunteers to help! Join us June 29th – July 6th for this incredible trip and get a chance to meet the wonderful villagers of San Pedro yourself. In participating, you will get to see the amazing result of years of hard work and planning come to fruition in a way that will transform an entire community. And who knows, maybe San Pedro won’t be the only thing transformed. Explore San Pedro de Casta Peru - CLICK HERE! Globe Aware Volunteer Sophie Marsh recognized all around as Superstar student! Not only was Sophie chosen by Globe Aware to be Volunteer of the Month last October, but her local community is also recognizing her philanthropic efforts and dedicated involvement with the village of El Sur, Costa Rica. 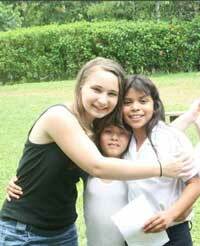 Sophie traveled to El Sur on a school trip a few years ago with Globe Aware and has since returned three times. And she doesn’t plan to stop! Our superstar volunteer is already planning her fifth trip to El Sur. We can’t wait to hear about what adventures it brings! For some, the annual Galileo sophomore trip to Costa Rica is just a fun opportunity to get away from school and hang out with friends in an exotic place. But for senior Sophie Marsh, the trip was a life changing experience. Following the class trip in Spring of 2011, Marsh returned to El Sur, the same Costa Rican village the Galileo program visited, and bonded with the village members. She just returned from her fourth trip on January 19, and is already planning a fifth. Marsh takes these trips with Globe Aware, a non-profit organization that plans short term international volunteer trips that encourage travelers of any age to immerse themselves in different cultures. Globe Aware promotes “voluntourism,” an idea that encourages people to use their vacation time to help others in need, instead of engaging in the typical tourist activities, like visiting museums or riding tour buses. Globe Aware has cabins for the volunteers in the village, but all meals are provided by the village families. After her first trip, Marsh spent one week in Costa Rica with a family from Virginia, and the second week alone with only the local trip supervisor, who spoke little English. On her third trip, she was alone for one week, and on her fourth trip she was alone in the village for two weeks. Marsh has taken French since middle school and throughout high school, so at first, she felt an obvious language barrier with the villagers. But after several trips, Marsh decided to learn Spanish in order to communicate more efficiently. Last fall, she started taking a Spanish night class at College of Marin. “This time I found it was a lot easier to talk to them because of that,” she said. Marsh has made many friends in the small town in Costa Rica. “It feels like family down there now,” said Marsh. “I’ve been enough times that I feel like I’m friends with everyone now from the little boys in town to the elderly grandparents. It doesn’t feel like I’m just a volunteer in a strange new place, it just feels like home.” El Sur is a very small town according to Marsh. “There are five or six main families, and about 40 people in the whole town,” said Marsh. The town is made up of the family’s houses, a small convenience store, a community center, a church, and a school. El Sur is in the Carara National Park on the Pacific side of Costa Rica, and is about an hour away from the major city of San Jose. Marsh went during the summer on her first three trips, which is Costa Rican winter, where the weather was warm in the mornings but there were many rain showers during the afternoon. Her last trip this past winter break was during the Costa Rican summer, so it was extremely warm in the mornings (about 100 degrees Farenheit), and then the afternoon provided a nice breeze and a break from the heat. “I much prefer the Costa Rican summer because there are fewer bugs and mosquitos,” Marsh said. Marsh has done various kinds of service projects on her trips, from planting trees to fixing an irrigation problem in town by building a new pipe system. In the mornings, she worked for about four to five hours on the projects, and then spent the afternoon with the villagers, who often played soccer. When she wasn’t playing soccer, she took all the little kids out to the river to go swimming, or go on outings with the families, such as attending a professional soccer game, horseback riding, or hiking. Recently, Marsh was accepted to the Global College, which is based out of Long Island, New York. Global College teaches students about other parts of the world by physically immersing them in a foreign culture. If she attends, she will be spending next year living in Costa Rica, not too far from El Sur, where she will be able to visit much more often. 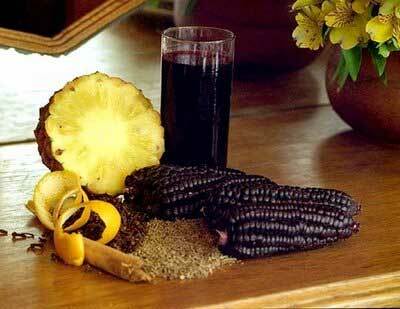 This cool, refreshing drink made from purple corn is indigenous to the Inca Natives of Peru. Try it out and you’ll be ready in no time to gear up for some sunny, summer days! 1. Bring the water to a boil with the corn, cinnamon sticks, and cloves in a large pot. Reduce heat to medium-low; simmer 40 minutes. Remove from the heat and strain through a mesh strainer to remove the corn and spices. Stir the lemon juice and sugar into the chicha until the sugar has dissolved. Refrigerate until cold. 2. Stir in the chopped pineapple and apple before serving over ice.